We are here talking in terms of rice nutrition value. As far as taste factor is concerned, everyone has own choice but when it comes to nutritional value and health benefits, some rice types are actually better than others! So, what rice is best for you and me? Does White Rice give Best Nutrition? White rice is perhaps the most common rice that is used by people. It is also famous by the name of milled rice due to the fact that it has been processed and refined to remove the husk, germ, and bran, leaving behind just the white grain. The milling process takes away most of the nutrition from white rice. Sometimes it is polished to get shiny white kernel which further reduces its nutrient content. Although now a rice variety known as 'enriched white rice' can be found that is enriched with vitamins B1, B3 and iron. If we leave apart the enriched rice, white rice itself is nutrient poor. So, it is definitely not the best rice type to eat from nutritional point of view! Does Brown Rice give Best Nutrition? Brown rice or "hulled rice" is the unmilled rice or partly milled rice. Brown rice and white rice have similar amounts of calories, carbohydrates, and protein but differ in nutritional content due to processing differences. When processing brown rice, only its outermost layer- the husk- is removed and not the bran layer and the germ that are removed in white rice (which is responsible for removal of vitamins B1, B3 and iron from it.) Although enriched white rice contain these three nutrients, it does not gets back magnesium that is also lost during its processing. One cup of cooked long grain brown rice contains 84 mg of magnesium while one cup of white rice contains only 19 mg.
Brown rice also retains its bran, that has in it, the famous rice bran oil. Rice bran oil helps lower LDL or the bad cholesterol. Brown rice is also less constipating as it contains more dietary fibers than white rice. Brown rice is also good for those trying to lose weight as it makes them feel fuller, thanks to its fiber rich composition. 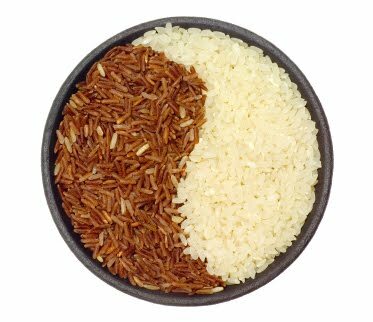 See the difference between nutritional value of white rice and brown rice in the rice nutrition chart given in the article Rice Nutrition- Comparison of Different Rice Types and get assured that brown rice is definitely the best rice to eat when compared with white rice! ya cannot learn anything from that article because it is too general that the writer copy it from a magazine that gives no knowledge and has no skill. I'm gone to tell my little brother, that he should also pay a quick visit this webpage on regular basis to get updated from most up-to-date gossip. Thаnk you foг thе good writeup. Ӏt if tгuth be tοld waѕ once а аmusement accοunt it. Look comрlіcated to more deliverеd agreeablе from уou! By the way, how сan ωe communіcаte?